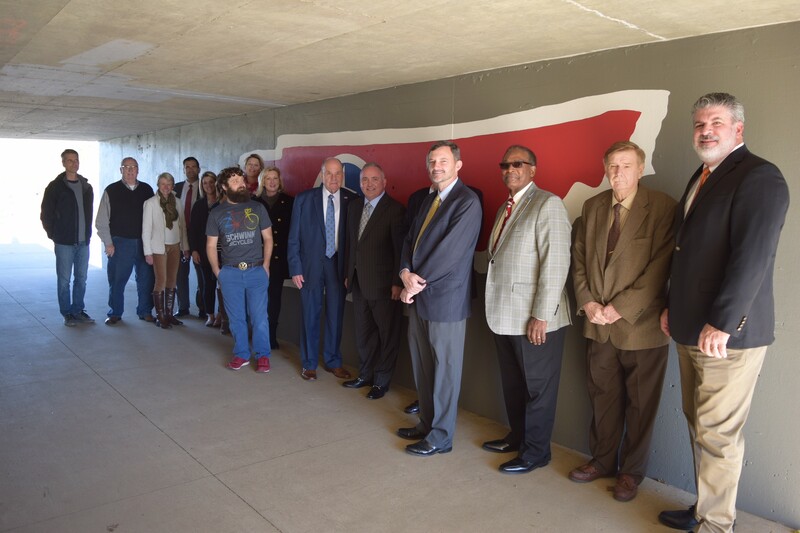 The bridge now includes a mural of the city seal on its north side, the Tennessee three star symbol on the south side and a red, white and blue image of the state on the wall where the Mouse Creek greenway takes pedestrians beneath the structure. The state outline includes a marker showing Cleveland’s location in the southeast corner of the image. The artwork is titled “Sixteenth State, Seventeenth Street,”” said Tara Brown, chairwoman of the Greenway Public Arts Committee. “GPAC’s mission is to place public art along the Greenway,” she said. State Representative Kevin Brooks said he approached GPAC and Cameron Fisher, chairman of the Cleveland/Bradley Greenway Advisory Committee, about two years ago with the idea. “Just like Nashville with their murals where people line up for photos, we believed we needed some art that represents Cleveland and our state,” Brooks said. GPAC, the Greenway Board and Friends Of Kevin Brooks participated in the project. The Greenway Public Arts Committee commissioned artist Ryan Snyder to paint the murals at no cost to the city. “Public art adds excitement and enjoyment along the Greenway,” said Mayor Tom Rowland.